Do you know that you can make changes to the boarding station after buying tickets for rail travel? This facility is available on Indian Railway Catering and Tourism Corporation (IRCTC) website. This service is for those railway passengers who want to change the boarding station due to an emergency or personal needs. The service was started by IRCTC already. Explain that this service is for users who have booked online tickets. This facility is not available for I ticket. Apart from this, the boarding station cannot be changed in the ticket purchased through the option service. Such change boarding station on IRCTC website ...1. Log on to IRCTC's website. Use login id and password.2. 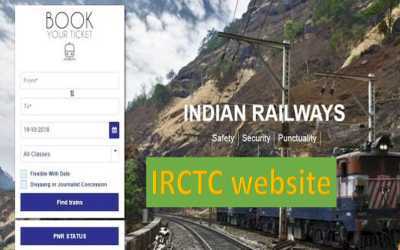 Visit My Account on the new website of IRCTC. Go to My Transaction Options here in the mouse over. After this, choose the option of 'booked ticket history'.3. After that select the ticket in which the boarding point is to be changed. You will see different options on the bottom, like PNR status, Cancel ticket and others. This is also the option of a change boarding point here. Click on it.4. After this, a pop window will open. In which will be the name of the station so that you can choose your new boarding point. This is where you change your boarding point. Important things related to changing the boarding station on the IRCTC website ...1. It is possible to make changes in the boarding station 24 hours before the scheduled time of opening the train.2. According to the IRCTC website, if the passenger once changes the boarding station, then he will have no right to travel on that ticket from the earlier boarding point.3. If the passenger is found traveling from old one's boarding station, then he will have to pay rent from the station to the new boarding point along with the penalty.4. According to IRCTC rules, it is possible only once in the boarding station, changes are possible. This change is not possible in the Karachi Booklet ticket.